Painted Countertops: Painting Your Countertops to Look Like Marble - Lovely Etc. 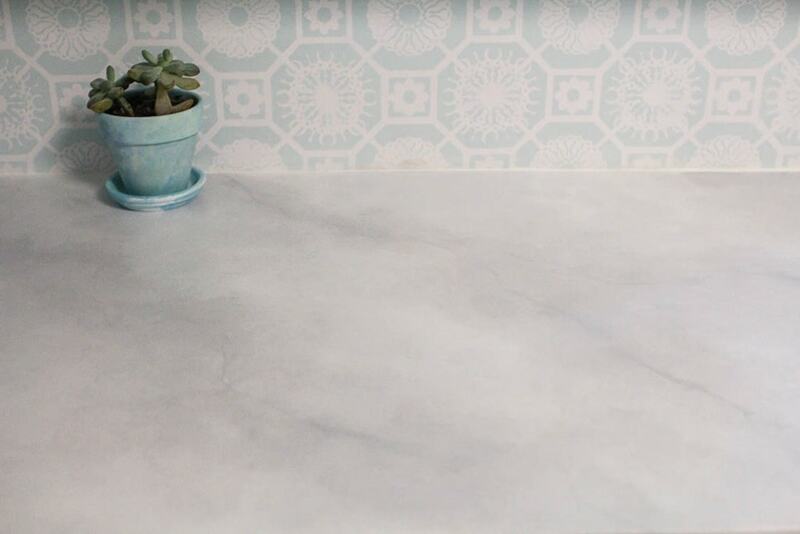 I am so excited to share my painted countertops with you guys! Painting our old laminate countertops was a huge risk and I wasn’t exactly sure how it would turn out. But I hated our old countertops and there was absolutely no way we could afford to replace them, so I decided to just go for it. And this time, the risk definitely paid off! We have been using our “new” counters for a few weeks now and they look amazing – you would absolutely never guess that they were painted. 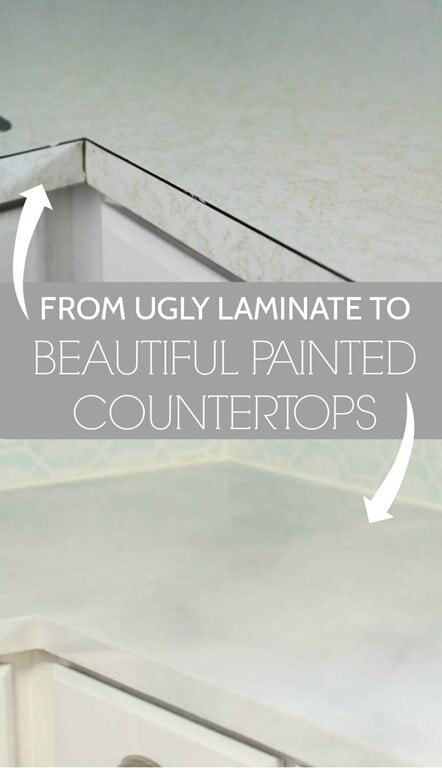 I’m sure most of you have seen these white and gold laminate counters at some point or another – just probably not in the last decade or two! They were terrible. I’m actually a big fan of laminate countertops because they are so incredibly durable; but ours were just so horribly ugly and dated. Aside from the terribly gold squiggly lines, the black edges that wrapped around everything managed to make the whole kitchen look cheap. I lived with these countertops for eight years because I knew we couldn’t afford to replace them. We are blessed to have a ton of counter space in our kitchen which is great for cooking, but makes replacing all the counters incredibly expensive. I looked into replacing them with laminate, butcher block, even concrete. But even though butcher block and concrete can be done more affordably, the amount we would need was really going to drive the price up. Plus I really didn’t want concrete or wood countertops. I think both can be beautiful, they’re just not for me. Which led me to paint. At this point I pretty firmly believe that paint can save almost anything. I’ve painted floors, walls, cabinets, a backsplash, light fixtures, sliding doors – everything. And while a few times, it hasn’t worked out in the long run, 95% of the time it has been amazing. And this – this was definitely one of the amazing times! 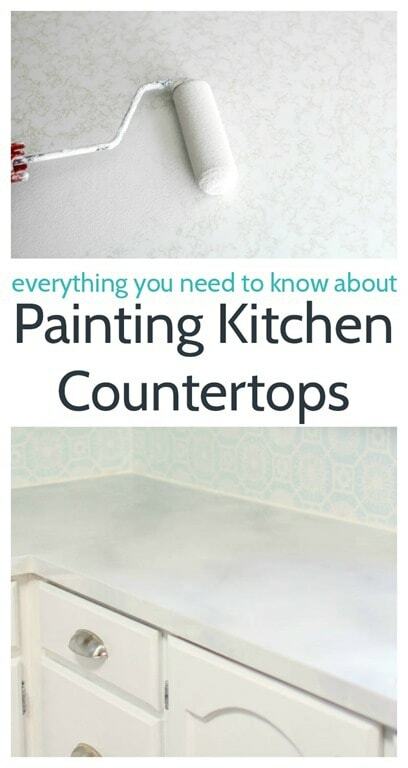 This is a very inexpensive and beautiful way to update your countertops, but it does take time and attention to detail. And there are a few tricks you really need to know before you start. But if you are willing to try, you can definitely do it. Because this is a very detailed tutorial, I am breaking it down into two parts below: painting and then sealing. And if you don’t care about the tutorial and really just want to see more beautiful after picks, just skip to the end! I used Zinsser oil primer. Personally, I have found that oil primer always works best on surfaces that may try to resist paint like super-smooth counters. You could choose to paint your counters to look like just about anything – granite, a solid white or black slab, or marble which is what I chose. Our kitchen receives very little natural light so a big goal of my super cheap kitchen renovation was to bounce as much light around the room as possible and marble is perfect for that. 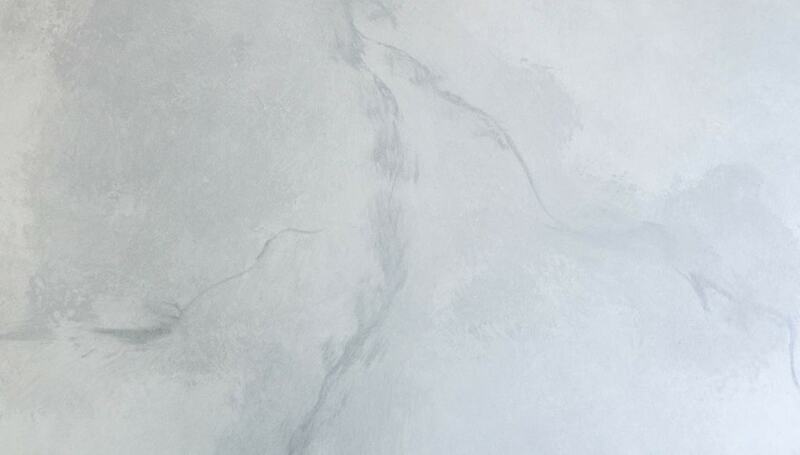 Plus, I just think carrera marble is incredibly beautiful. 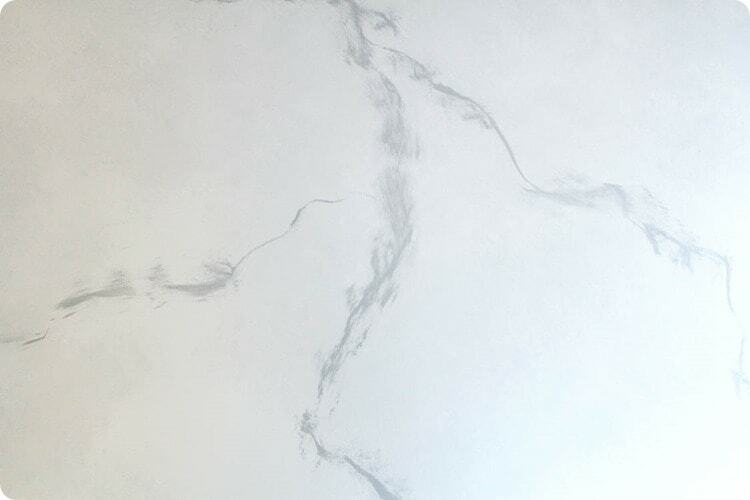 There are lots of variations of marble – it can be more white or more gray, with a heavy pattern or light. I chose to make my counters very light and keep the grain very subtle. I did a search online and found a picture of a marble slab I liked and used that as my guide. Before you get started painting, be sure to use painters tape to protect anything you don’t want painted. In my case this included the backsplash, sink, and cooktop. The first step in the actual painting process is sanding. 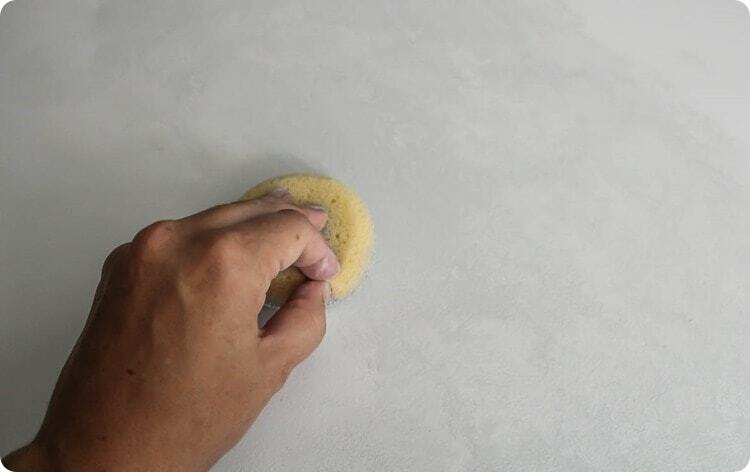 Lightly sand the entire countertop with 100-150 grit sandpaper. This will help roughen up the surface and help the primer and paint stick. 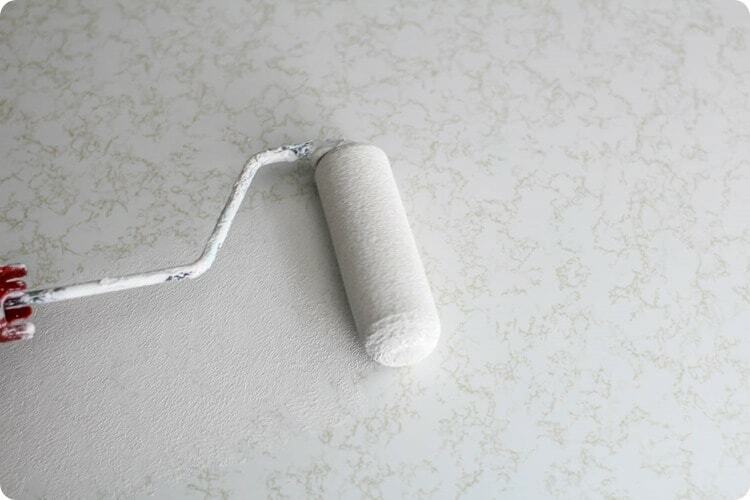 Use a small roller to roll a coat of primer over the counters – don’t forget to do the edges as well. 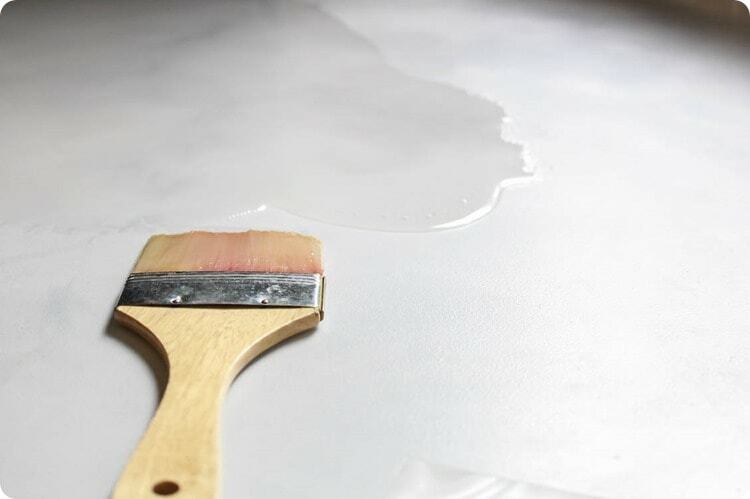 Allow the primer to dry completely and then lightly sand the surface again. Use a roller to roll a coat of white paint over the entire countertop and allow it to dry. When it comes to paint for this project, pretty much any paint will do. I used white paint leftover from painting my bathroom and some gray paint samples I already had. Craft paints will also work. Any type of paint will work just fine over oil based primer and it really doesn’t even matter if it is matte or semi-gloss because the shiny topcoat will cancel all of that out anyway. 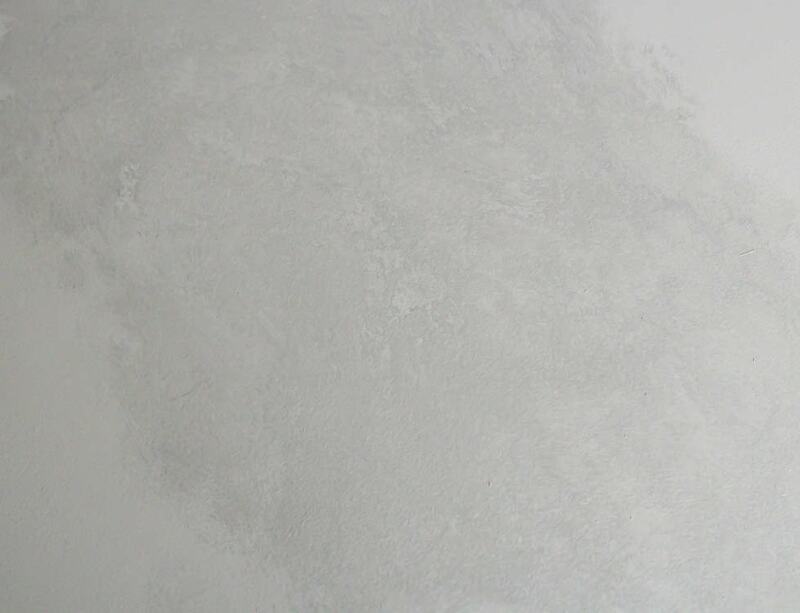 Once the white paint is dry, start adding the variation found in a natural piece of stone. I dabbed my medium gray paint on randomly with a round brush and then blotted it with the sponge. Then it is time to add the grain. Using a feather gives the most realistic grain pattern. (A fake feather from a craft store works great.) Just dip the tip of the feather in the darker gray paint and lightly draw it across the counter. Allow for lots of turns and movement in the line. I chose to soften my lines a bit by brushing a clean paintbrush over my paint lines. Then use a round brush to dab more of the medium gray paint on and spread it around with the sponge. Repeat with the lighter gray paint. Continue to sponge the paint on creating lighter and darker areas until things look the way you want them to. The best part about painting counters is that you can easily fix any mistakes you make by simply painting over them. My first attempt at drawing on grain lines was terrible – the lines looked more like lightning than marble. So I painted over them and started over. If you find your counters are looking darker or lighter than you wanted, just add more layers of paint until it looks right to you. And then you’re ready for sealing. This is where the real magic happens. Before sealing them, my counters looked really cool – but they also looked very much like they were painted. 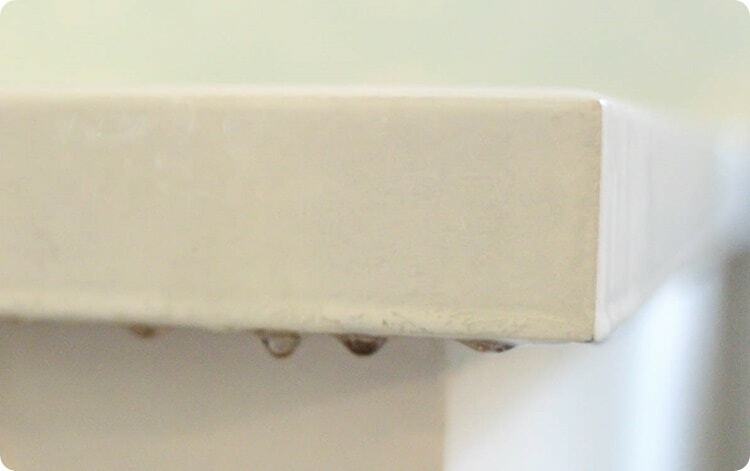 This sealer is what gives them the glossy, realistic look. 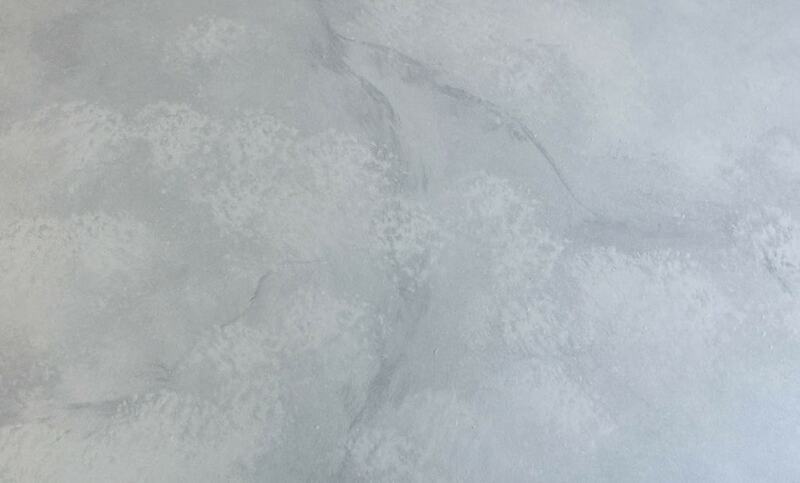 I chose to use Envirotex Lite rather than a regular polyacrylic sealer. Both are crystal clear and non-yellowing. But the resin is much, much thicker than polyacrylic which makes it more durable and also more realistic looking because of the depth it adds to the paint job. It is also self-leveling and dries to a perfectly smooth finish – something I have never quite been able to accomplish with polyacrylic. This sealer is also heat resistant which is important in a kitchen. It does, however, require a bit more preparation and attention to detail. Also, I did this on my own but it would be much easier to do as a two-person job. 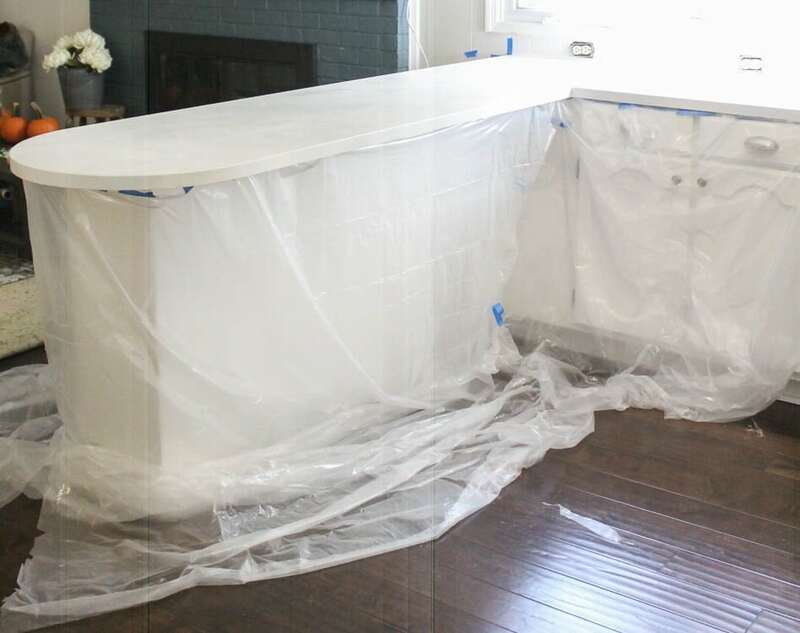 Be sure to protect your cabinets and floor completely with plastic drop cloths and tape before beginning. In order for the sealer to self-level, it has to be able to drip freely off the edges. Anything that isn’t protected will end up covered in sealer. In a few areas, my dropcloth slipped and cleaning the sealer off the cabinets was a huge pain. I was able to get it off using a scraper and rubbing alcohol, but I wish I had been able to avoid that extra hassle. Also, wear latex gloves and old clothes. If any of the sealer gets on your clothes, it will harden and you won’t be able to wear them again. 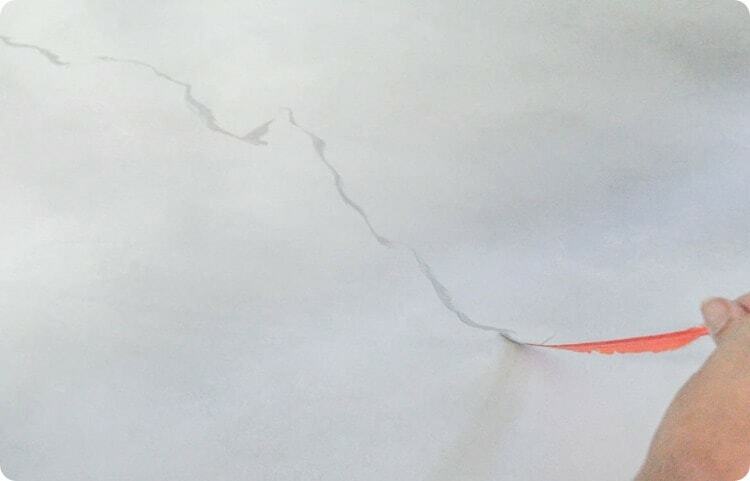 Do not skimp on sealer.  I ended up doing two coats on my counters because the first coat had several sections that were not as smooth. Near the end I was running out of product and was trying to make do with what I already had on hand to save time and money. Big mistake. I ended up having to do a whole second coat to fix these areas which clearly cost twice as much time and money! Be sure to have plenty of product on hand before you start. Envirotex Lite comes in a kit with two different bottles. These need to be mixed together to make the final sealer. This is a chemical process and it is very important that you follow the instructions included with the product exactly. One of the important steps is measuring equal amounts of each liquid. I started out using a measuring cup, but quickly realized it was way too small. So instead I used a disposable drinking cup and just drew a line to use as my measurement line. Also, the mixing process alone takes several minutes. It is much easier to mix enough for the whole counter at once rather than rushing to mix a bunch of small batches. Once everything is thoroughly mixed, pour it onto your counters. 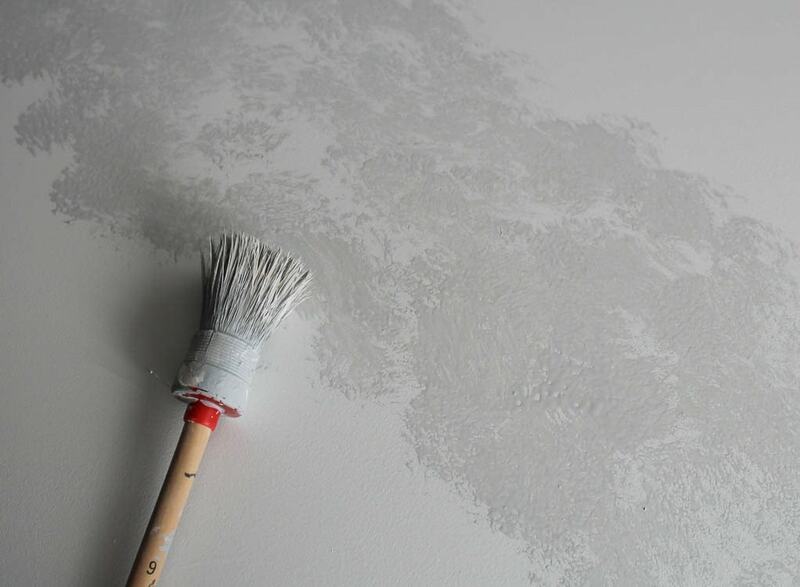 Use an inexpensive paintbrush to spread it around to cover the entire surface including the edges. Double check that it reaches all the way back to the wall. The directions say to use a butane torch after fifteen minutes to eliminate any bubbles. This is such an important step. There will be tiny bubbles everywhere and when you point the torch at them for a second, they disappear like magic! A hair dryer will not work for this – it must be a butane torch. (It is the carbon dioxide that takes care of the bubbles. ) The other option is to use a straw to blow on all of the bubbles. Do not attempt the straw method! I tried to do it this way at first because I’m cheap and I didn’t have a torch. It was a huge mistake. It took way too long and was really difficult. 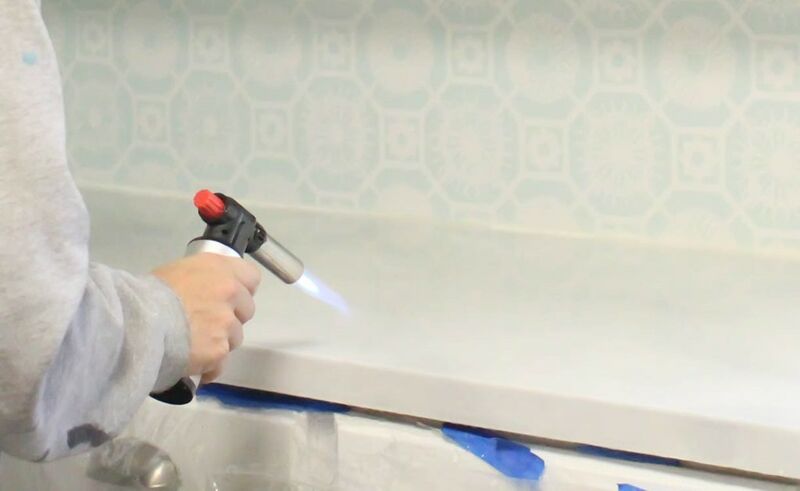 That may be fine for a very small project, but if you are doing your countertops, just buy the torch. I used a torch for the second coat and it was 1000 times easier and so worth the cost. You can’t let anything touch the counters for at least 8 hours including dust or water. At this point they will be dry to the touch but they won’t reach full hardness for a full three days. If anything does mess up the finish of your counters – dust, water drips, or whatever, you can fix it fairly easily by adding another coat like I did. If you end up with lots of drips like I did, you can easily scrape them off with a paint scraper. They come off more easily during the first day before they have completely hardened. Ready for some after pics?! I really love how shiny and beautiful these are! And I’m so glad those ugly gold squiggles are gone for good! As far as taking care of these beauties, don’t set anything hot on them – it will yellow the resin. (This includes leaving a Crock-pot cooking on the counter. Long story, but luckily there was a happy ending.) Also, as with most counters, don’t cut directly on the counter. I will keep you updated on how these hold up. Like I said, we are two weeks in and so far, so good. Wiping them down is easy and we haven’t really had any problems so far, but only time will tell. 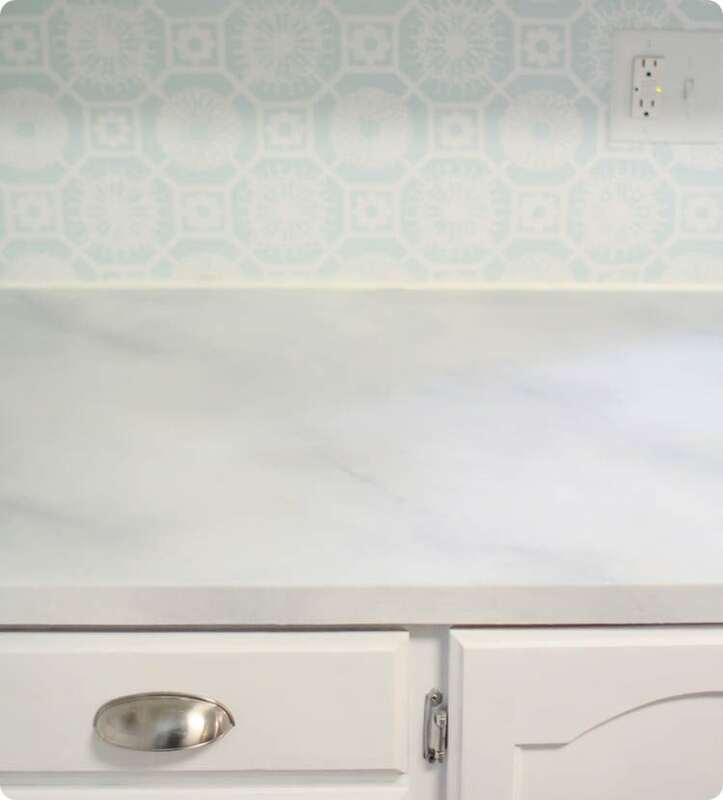 How much do painted countertops cost? Ready for the final cost breakdown? It would have been half as much if I hadn’t had to go back with a second coat. (Lesson learned!) But, all in all, it was still a small fraction of the price of replacing our counters. 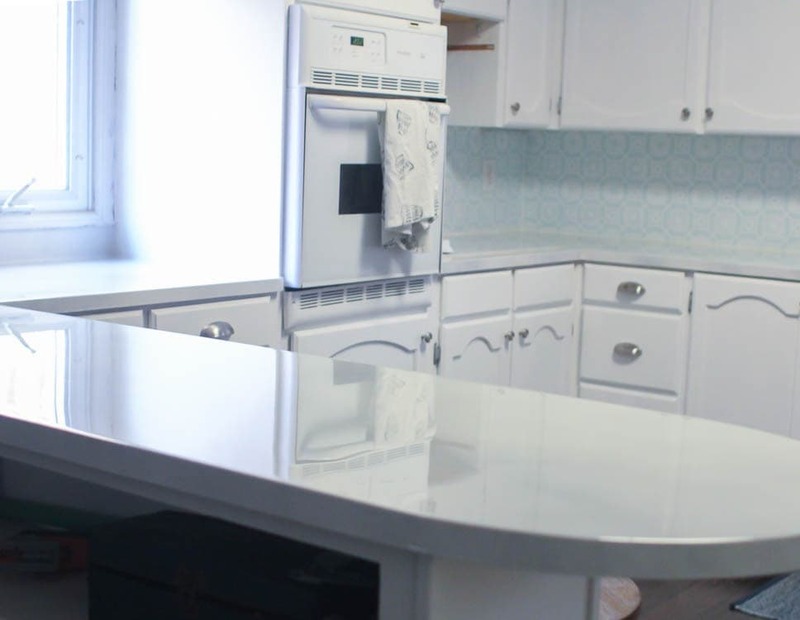 Your cost will depend entirely on how much countertop you are dealing with. Our kitchen has 51 square feet of counter. It was so worth the cost! 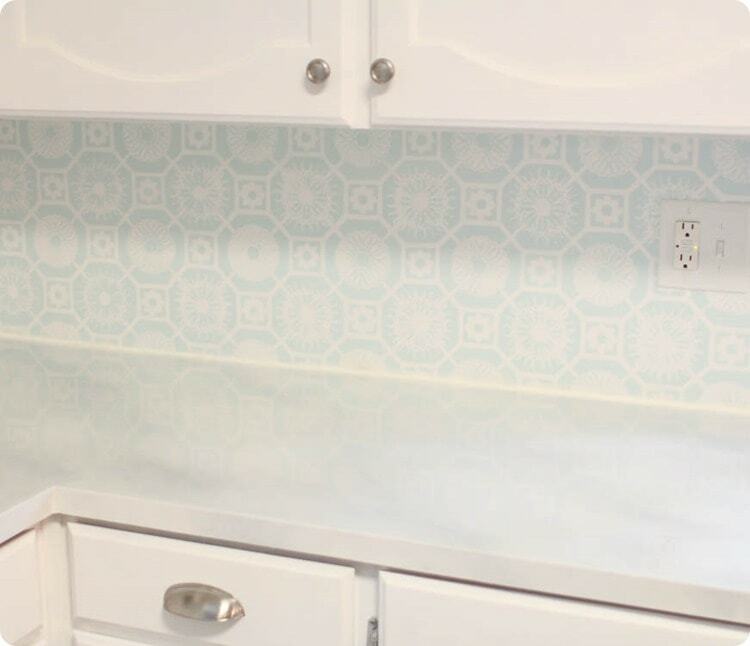 There are only a few projects left until this kitchen redo is finished! I cannot wait! Carrie, you worked so hard at this!!! It looks great and your kitchen is looking so lovely! You are so inspiring how you keep plugging away at your job list….it WILL get done! Great job! Thank you Shana! I have to remind myself of that all the time – it will get done eventually, just not nearly as fast as I would have liked! Looks AMAZING!! This whole blog is so inspiring! Thank you so much Rita! Thank you so much for this Carrie! I have some country blue from the 80s on my counter tops and have wanted to change them for years. I am definitely going to try this. They look beautiful and for a great price. I would love to know how they hold up over the years. Thanks Kelly! I have had them for close to a year so far and they have held up well but not perfectly. Some areas look slightly yellowish to me where the sun has hit them. Other people still say they look great but I’m a perfectionist so I notice. My sister and I painted her counter tops to look like granite. The painting part was easy and fun, and they looked amazing after we finished. OUR biggest mistake was the sealer, polyacrylic. It yellowed and turned the whole thing into a giant disaster. She is having new counter tops installed next week. Some projects are better left to the pros. You did an amazing job and I have my fingers crossed that your tops will remain gorgeous for many years to come. Thanks for sharing, just wish this tutorial was available when we did my sisters. Thank you Mary! The sealer really is the tricky part. I would love to get new countertops in the future so if these can hold up for another year or two, I’ll be thrilled! That is a fabulous job, thank you for giving me the confidence to know that it can be done. can I tell you a trick that I used on my grandma’s floor? I used mineral makeup as a metallic enhancer. I have several colors, so to enhance the theme of the room, I added 2 spoonfulls of my loose powdered shimmer shadow to my epoxy, mixed well, and poured. For the second coat, I used a different color that also enhances the color theme, poured in the direction of the swirls, then poured the crystal clear over it all. It turned out like 3d marble. Perfectly beautiful. Shannon, That is a fantastic idea! Thanks so much for sharing – I will definitely file that one away for future use! 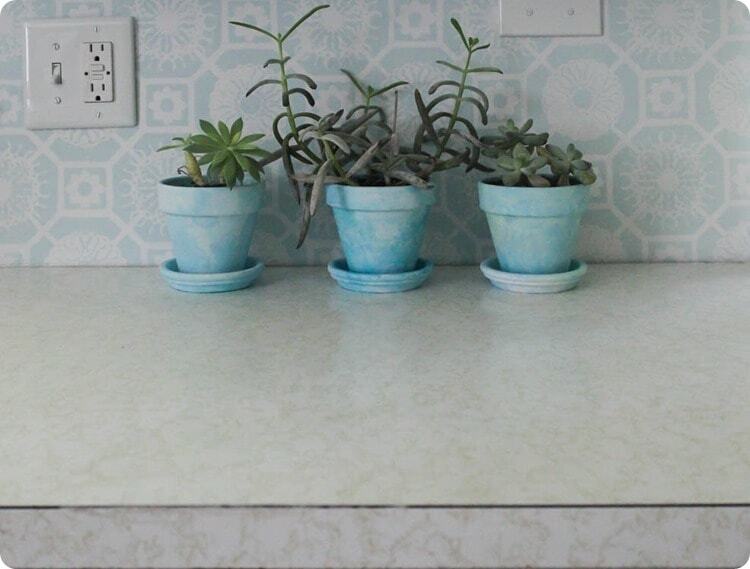 I painted our Formica countertop in our 2nd bathroom. The resin part was a disaster. It was awful. Now I’m too scared to attempt it again. I’m thinking of using General Finishes poly. Oh no! I’m so sorry to hear that. 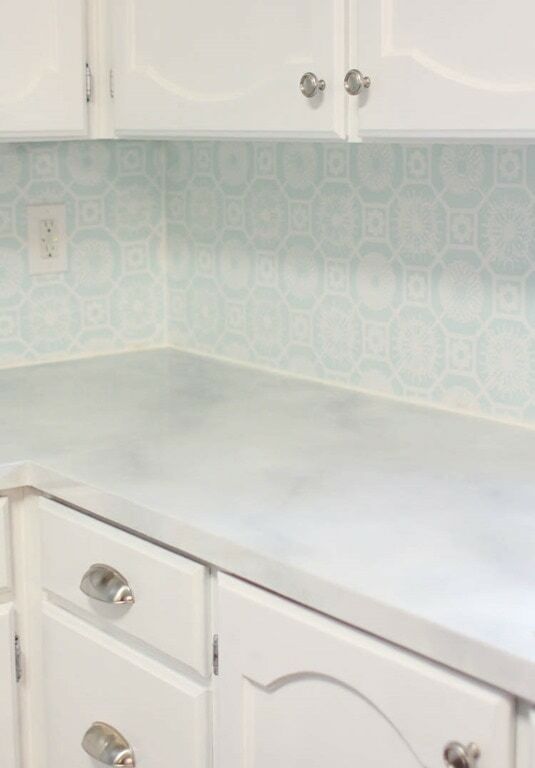 I haven’t tried General Finishes for a painted counter but I really like it for furniture. Good luck! How long did you wait between painting and applying the sealer? I believe I waited a couple of days between. As long as the paint is fully dried, it should work fine. 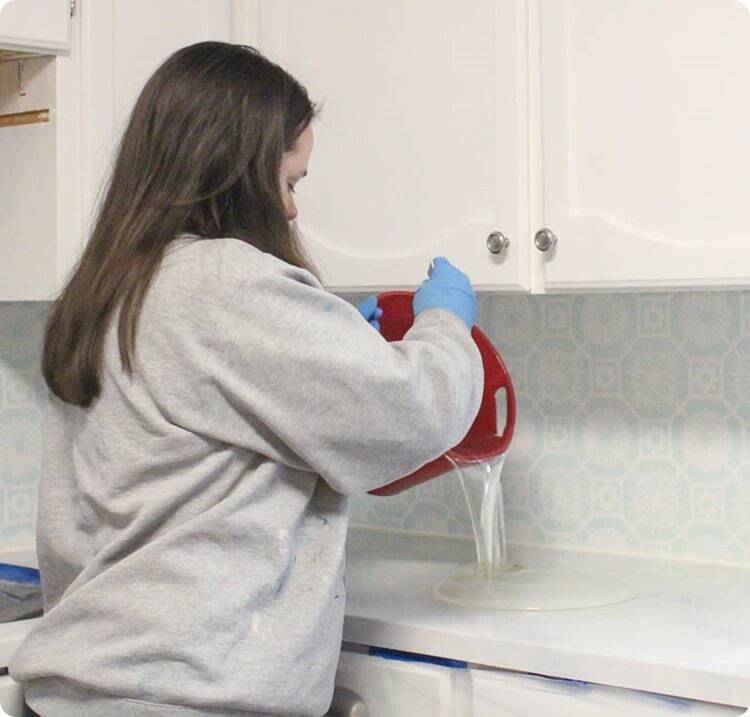 How did you deal with pouring the resin around the sink? Did it self-level ok? 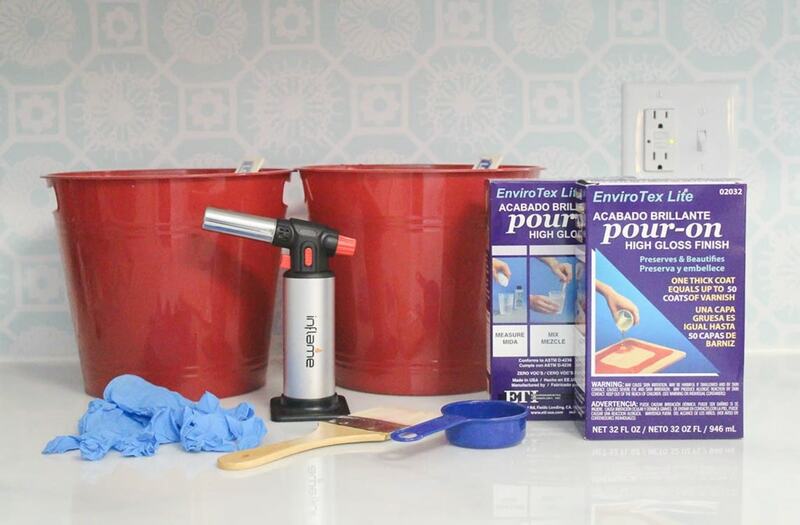 I’m doing a similar project in my bathroom and want to make sure that I don’t get resin all over the sink! Hi Madison, The resin did ok for me around our sink. We have an older sink that has a lip that sits on top of the counter so I taped that off with painters tape and covered the sink and it worked fine. An inlaid or drop in sink would be a bit more tricky but I would do the same. Carefully tape off and cover the part I don’t want covered. Good luck! This looks amazing and I’m truly thinking about giving it a try in our kitchen! Since its been some time since you did this how is it holding up? Any new changes or suggestions? Hi Aimee, it has been around two years now and I really need to write an update! The countertops are still holding up really well but the sealer (resin) has yellowed slightly in one section. I really don’t know why – it is near the stove so may be related to heat? Otherwise they are holding up really well. If I were going to do it again today, I would definitely still paint them, but might try using a good water-based sealer instead of the resin I used. Pouring the resin was by far the most difficult and messy part of this and I’m not totally convinced it was worth it. You are so right Adele. It was a lot of work, but I am really glad I did it. I would like to known if you placed your toaster on the bare counter or you placed something under the items? Did you use felt or plastic tips underneath the microwave or roster oven? Jeannette, Great question. I try not to keep a lot of things on our kitchen counters since they are already magnets for clutter. We don’t use our toaster often so I keep it in a cabinet unless it is being used and our microwave is mounted over our stove. We do have a few things on the counter though including a metal breadbox and it hasn’t caused any problems for our counters. And my kids color and do craft projects and play at our breakfast bar constantly and it hasn’t been a problem at all – the counters are very durable.